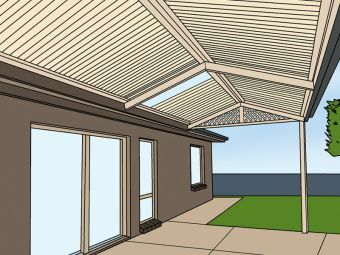 The Victory Long Span Verandah is available as a pitched verandah or carport. As with other Victory products, the Long Span is available in a range of 100% Australian Colorbond® Steel colours and finishes, with an amazing 3 different VDEK roofing options. Utilising the strength of double rolled Victory beams (a result of two decades of research) the Long Span is not only impressive to admire, but also means there’s no need for internal roof purlins. Available as a single gable or multiple gable option, the Victory Long Span is sure to add value to your home, as well as provide the perfect outdoor entertaining area. Ask about the ever popular downlight flashing to really finish your Long Span design in style.